Body Fantasies Kissing In The Rain is afwul. It’s not a fragrance – it’s a smell! And I would describe the smell as a mix of cheap hairspray, bed head, wet dog and sweat. Truly awful. 20+ New Products – Boots AND Superdrug Haul! Hi there! It’s almost Christmas. And since I’m planning some serious shopping this Boxing Day, I wanted to show you what I’ve bought so far this month. I expect to do another haul post after Christmas though. 🙂 OK, this is what I bought this month. I stocked up on Superdrug’s konjac sponges. They’re £1.99 each, but they’re on a 3 for 2 offer. So I bought 3 more. There are only two sponges in the picture, I know. Sponge number 3 is already in the bathroom, it’s ready to be used once I’ve thrown out my current sponge (which will happen in a few days). I picked up Zoella’s Kissy Missy Lip Balm for £1. 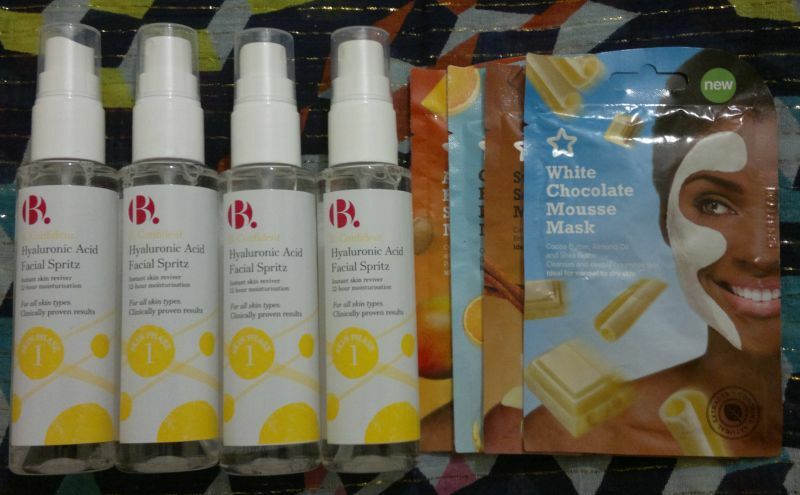 And I also bought B.’s Hyaluronic Acid Facial Spritz. It was £3.95 (half price offer) and I’ve wanted to try it for some time. So I bought it. 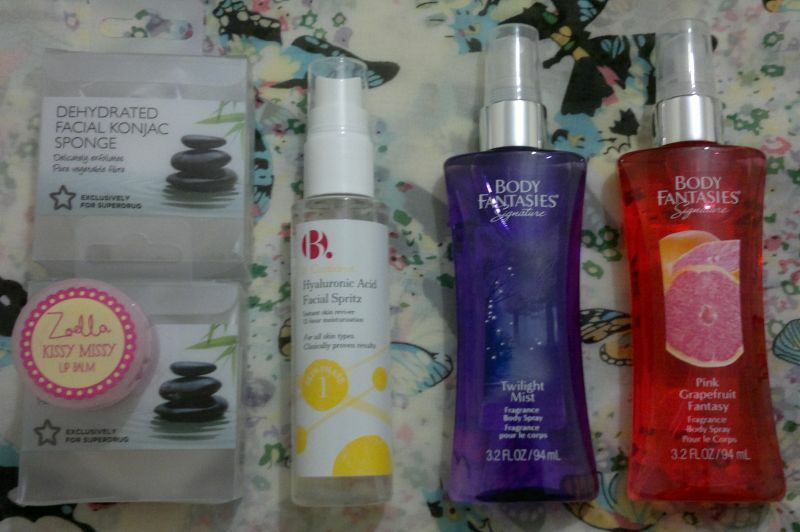 I bought two Body Fantasies fragrances – Twilight Mist and Pink Grapefruit Fantasy. I already have Grapefruit Fantasy, but these two were on a 2 for £3 offer, and they’re usually £3.99 each. And since I could have two body mists for less than the price of one, I just bought another Pink Grapefruit Fantasy body mist. By the way, I hate the Twilight Mist fragrance. I think it’s the stuff of nightmares. It smells like a cheaper version of Britney Spears’ Fantasy. My teenage relative will love it, no doubt! I bought another Superdrug Naturally Radiant Brightening Eye Cream. This eye cream isn’t brightening at all, but otherwise it’s a fairly nice eye cream. And it was £2.95 only. And finally I got my hands on Superdrug’s Naturally Radiant Hot Cloth Cleanser. This was £2.95 as well. I also swung by my local Boots store. 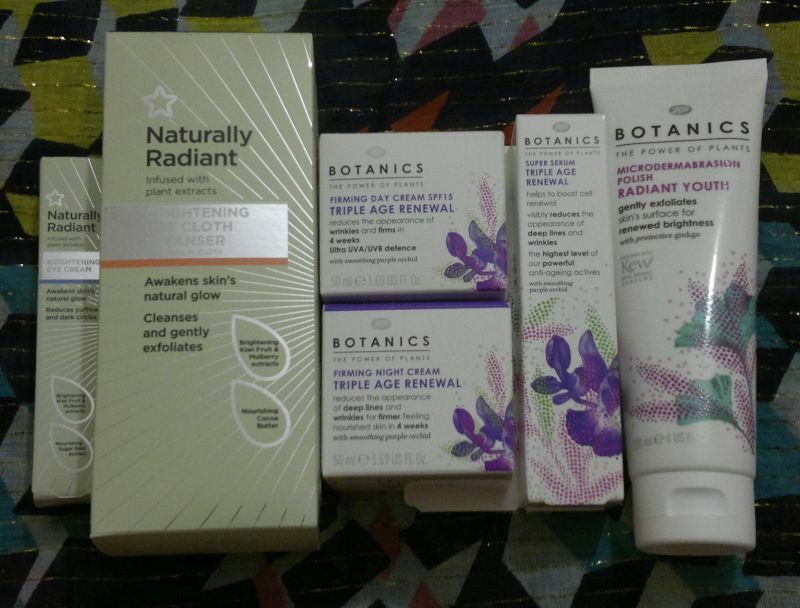 I bought Boots’ Botanics Triple Age Renewal Day Cream, Night Cream and Super Serum, and Boots’ Botanics Radiant Youth Microdermabrasion Polish. These products were £4 each. 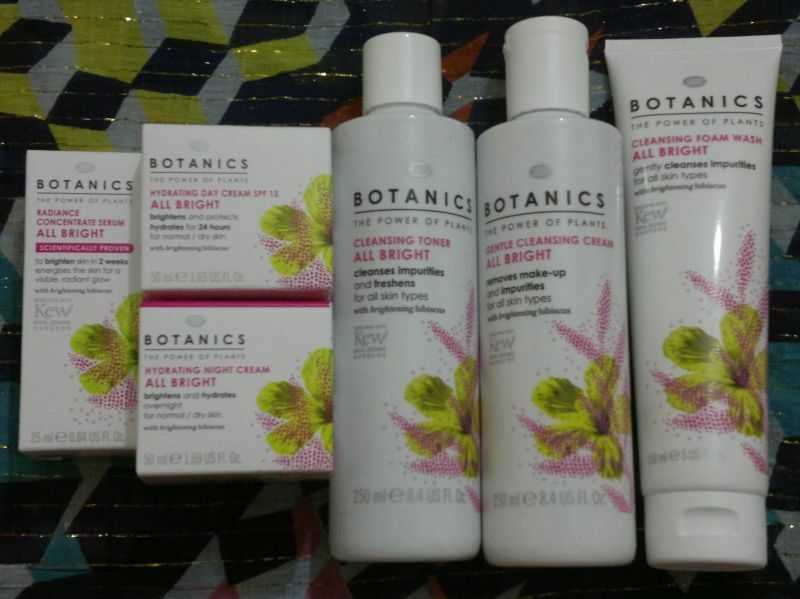 And I bought six products from Boots’ Botanics All Bright range – Radiance Concentrate Serum, Day Cream, Night Cream, Toner, Cleansing Cream and Face Wash. These products were £2.50 each. I’ve also stocked up on the Hyaluronic Acid face mists. Initially I bought one, but I liked it so much and I knew it would be stupid not to stock up. So I bought 4 more. The price was the same as before – £3.95 per bottle. Superdrug’s face masks were on a buy 1 get 2nd half price offer. The face masks are 99p each, and because of the offer I paid £2.98 in total for the 4 face masks. 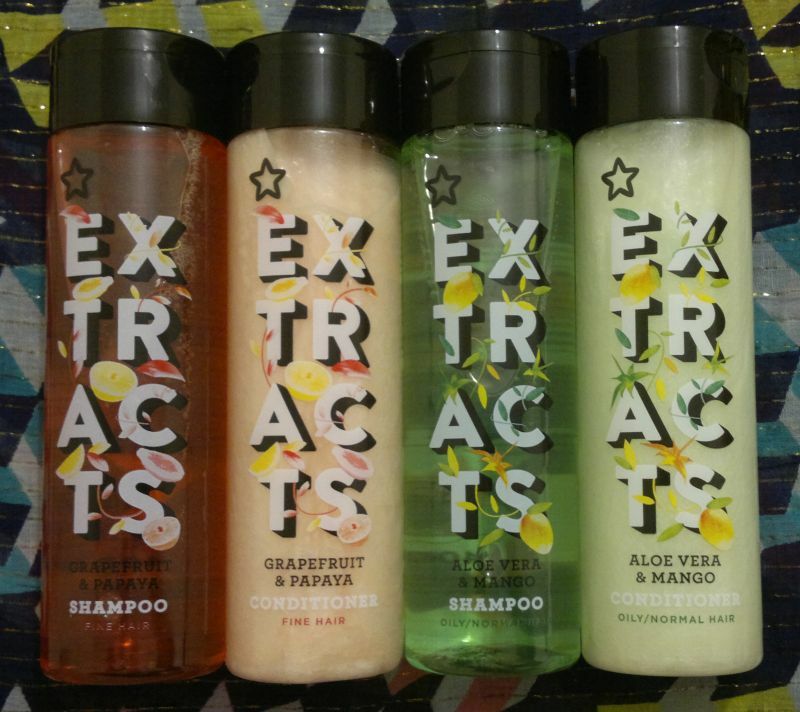 I also noticed that Superdrug had revamped their Extracts hair care collection. The bottle design is new, and they also had a few new fragrances. I liked Grapefruit & Papaya and Aloe Vera & Mango. These were 89p each. Normally the Extracts products are £2.29 each, but there was a better than half price offer. So this is what I bought this month. I spent just over £71 which isn’t much at all considering I got myself 5 hyaluronic acid face mists! I’m really happy with what I bought (even though I needed none of these products) – but I know I’ll go out hunting for bargains again soon. Feel free to get in touch via the comments. And thanks for stopping by! I appreciate it! And Merry Christmas and Happy Holidays! Hi there! If you read my blog regularly, you know I don’t just hoard toiletries and nail polish – I also have a ridiculous stash of fragrances and body mists. And today’s post is about two cheap fragrances I picked up at Superdrug a while ago, Body Fantasies Pink Grapefruit Fantasy and Body Fantasies Japanese Cherry Blossom. Pink Grapefruit Fantasy is a pleasant body mist. It smells like… summertime in Florida. I’d describe the fragrance as a mix of grapefruit juice and vanilla sugar. And I think this body mist is perfectly suitable for warm summer days. But, whilst I do like this body mist, it’s not my dream grapefruit fragrance. Japanese Cherry Blossom isn’t a scent I particularly enjoy. In my opinion this body mist is too strong, too heavy and too dense. I can’t even ‘analyse’ the fragrance itself because I just find it overwhelming. And unfortunately it also reminds me of the deodorant my mum used to wear in the eighties. I think if you like floral scents, you might want to try this. But if you too struggle with dense floral fragrances, this one might not be for you. I’ll pass my bottle on to a teenage relative.